Those in higher-income households are different from other Americans in their tech ownership and use. Analysis of several recent surveys conducted by the Pew Research Center’s Internet & American Life Projects find that there are key differences between those who live in households making $75,000 or more relative to those in lower-income households. Some 95% of Americans who live in households earning $75,000 or more a year use the internet at least occasionally, compared with 70% of those living in households earning less than $75,000. 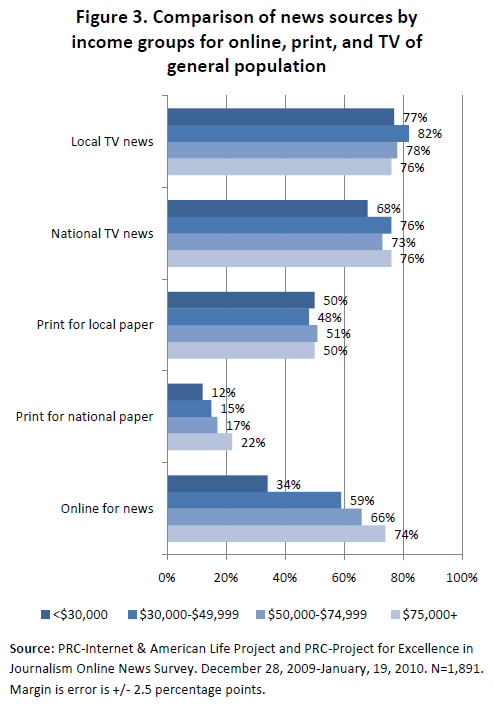 99% use the internet at home, compared with 93% of the internet users in lower brackets. 93% of higher-income home internet users have some type of broadband connection versus 85% of the internet users who live in households earning less than $75,000 per year. That translates into 87% of all those in live in those better-off households having broadband at home. 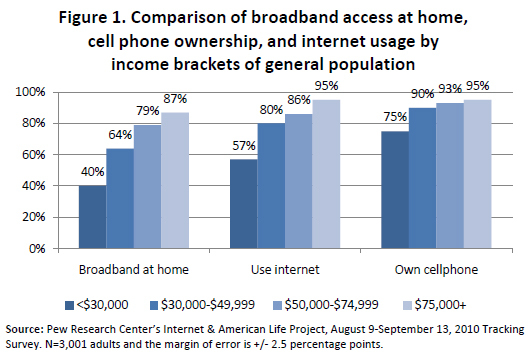 95% of higher-income households own some type of cell phone compared with 83% in households with less income. 79% of those living in households earning $75,000 or more own desktop computers, compared with 55% of those living in less well-off homes. 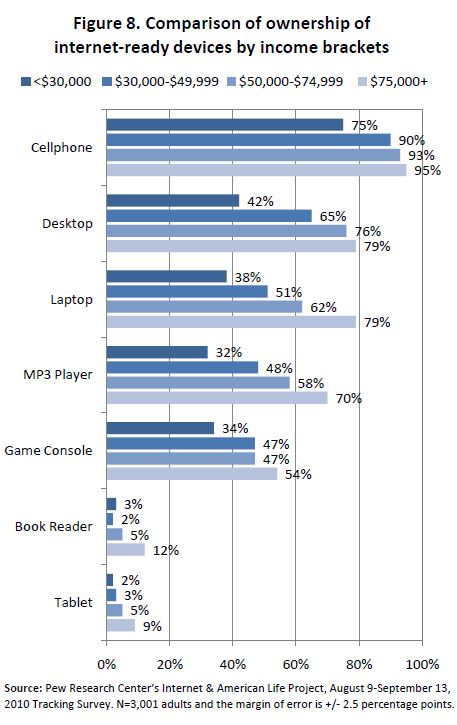 79% of those living in higher-income households own laptops, compared with 47% of those living in less well-off homes. 70% of those living in higher-income households own iPods or other MP3 players, compared with 42% of those living in less well-off homes. 54% of those living in higher-income households own game consoles, compared with 41% of those living in less well-off homes. 12% of those living in higher-income households own e-book readers such as Kindles, compared with 3% of those living in less well-off homes. 9% of those living in higher-income households own tablet computers such as iPads, compared with 3% of those living in less well-off homes. The findings in this report come from three surveys by the Pew Internet Project conducted in late 2009 and 2010. In each of those surveys, respondents were asked if their household income fell into certain ranges. 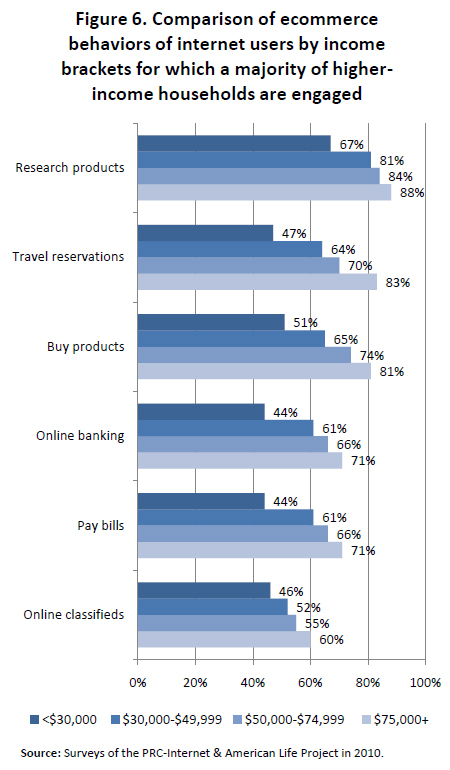 As in Pew Internet surveys in the past, many respondents were willing to provide income ranges for their household. Still, in each survey a notable number of respondents said they did not want to disclose their income: 17% in the survey in December 2009 – January 2010 did not disclose their income1; 16% in the April – May 2010 survey did not disclose their income2; and 14% in the August – September 2010 survey did not do so3. The analysis in this report covers the responses of those who did disclose their income. The internet users in higher-income households are more likely than others to go online multiple times a day, both at home and at work. Some 86% of internet users in higher-income households go online daily, compared with 54% in the lowest income bracket. 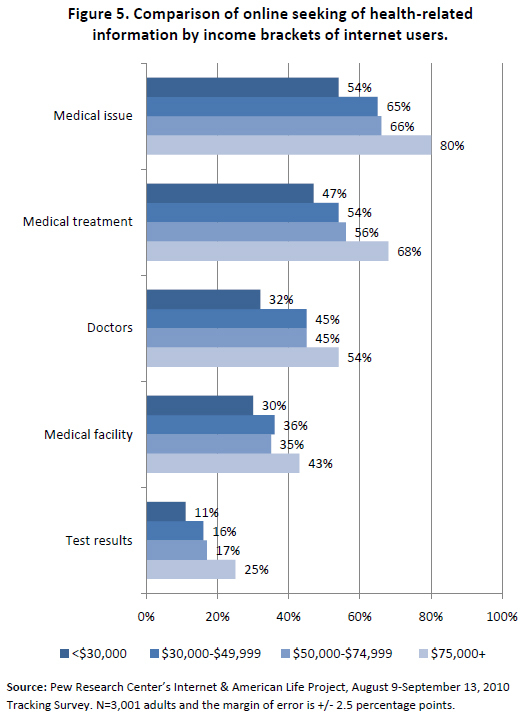 Online Americans in the higher-income bracket are fully engaged with seeking heath information and conducting other health-related activities online.3 Internet users in the top income brackets are more likely to search for medical information online, seek treatment information, seek material about doctors and medical facilities, and get data concerning test results. 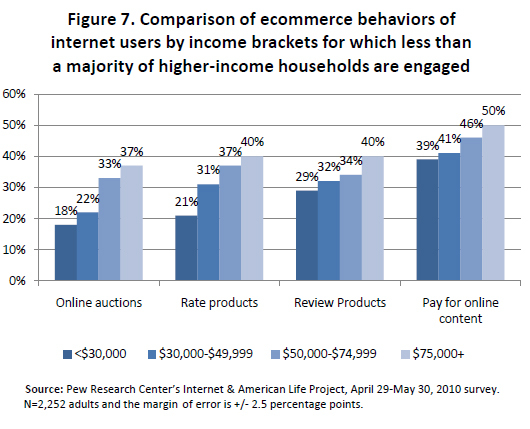 Significantly more higher-income Americans are conducting e-commerce activities than members of other income groups. Regardless of the control factor, those in the higher-income bracket were statistically significantly more likely to be internet and email users than those in the other income brackets with the same control factor. In nearly all cases, the practical effect of the control factor was minor: That is, the control factor did not add major explanatory effect to the relationship that was not explained by income level. Simply put, a person’s household income is an independent predictor of the likelihood that she or he will be an internet and email user and to be associated with the online activities we cite in this report. Concerning the use of the internet, differences involving gender, race, and educational level had no practical impact on internet use by income level. Those living in suburban and urban areas are slightly more likely to be internet users than their rural counterparts. There were also minor differences among the age groupings, especially with Trailing Boomers (ages 46-55) and Matures (ages 65-73), with larger percentages of these age groups using the internet when compared with those in the same age groups from lower-income households. However, with both community type and age, the differences were slight relative to what could be explained just by household income. We performed the same analysis for email usage. Again, most of these controlling factors were not substantial contributors to differences in whether someone was an email user or not. Gender, race, and educational level had no practical impact on email use. Those living in suburban and urban areas use email slightly more than their rural counterparts, although the differences were very slight. With age, we again found that there were minor differences among the age groupings, specifically with Gen X (ages 34-45), Trailing Boomers (ages 46-55) and Matures (ages 65-73), with larger percentages of these age groupings in the higher-income using email than those in the same age groupings from lower-income households. Again, the practical differences were slight indicating that age was not a major contributing factor. Given that $75,000 is only about one and half times the median household income of $49,777 4, we also examined those in the higher-income brackets exclusively.3 In the August-September 2010 Pew Internet survey there were 142 respondents who reported living in households earning $150,000 or more, which is the dataset used for this analysis. Examining those living in households with an income of $150,000 or more, there are significant differences with the other income groups. 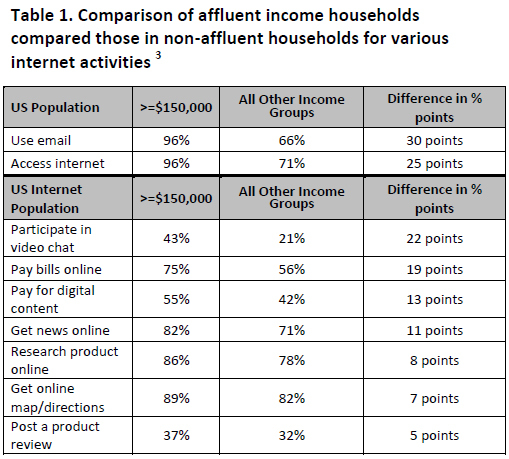 The affluent are significantly more likely to use the internet (30% more) and email (25% more) than the rest of the American population. Looking more closely at internet users, the affluent are more likely than other internet users to participate in video chat (22% more likely), pay bills online (19%) and get online news (11%). In fact, technology saturates the lives of affluent Americans. 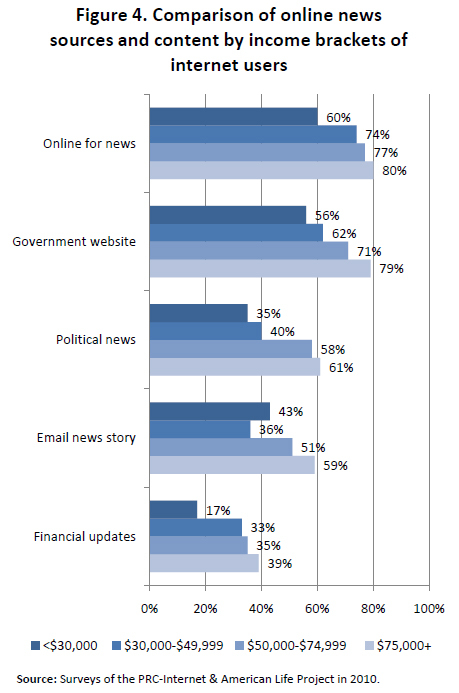 Nearly all (96%) of this affluent demographic use the internet or email. 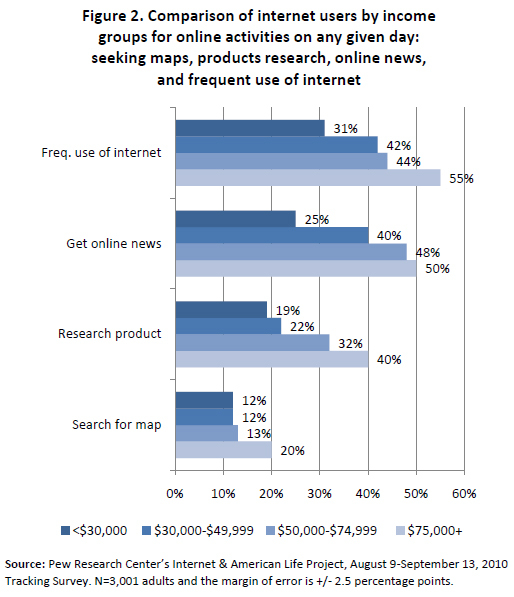 Nine in ten (89%) of the high-income internet users have searched online for maps or directions, 86% have researched a product online, and 82% get a portion of their news online.